PrimeLineTEX is available with widths of 5.6 or 2.8 meters and produces high-quality tissue for towel and sanitary applications. Photo credit Andritz. 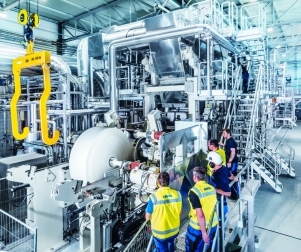 March 22, 2019 - ANDRITZ announced that it has officially launched its new tissue machine for textured tissue, the “PrimeLineTEX”, enabling customers to produce textured tissue of a quality superior to dry crepe and very close to structured (TAD) tissue, while at the same time achieving significant cost savings.